Some very dedicated Michigan fans/alums have put forward their time and money to create a full-page ad that is running on page 3 of today's Detroit News sports section. PDF link here. This group is trying to start an effort to create further support for Rich Rodriguez and his staff. In case you haven't noticed, things haven't been all unicorns and rainbows for Rodriguez since coming to Michigan in 2008. The focus here is to show the Michigan coaching staff that there are plenty of people out there that support the program and the direction it is headed. 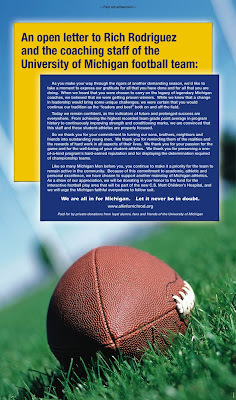 In an attempt to communicate to Coach Rodriguez and his coaching staff that the Wolverine Nation is excited to have them in Ann Arbor, a collection of loyal University of Michigan football fans joined together to raise money to put a “Show of Support” message in an upcoming issue of the Detroit News. To date we have collected enough to pay for a full-page color ad and we are exploring the cost of additional newspaper ads as well as billboards in and around Ann Arbor. I hope that my post here shows that I also fully support this effort. And no, I have not seen any of these "private donations" that were used to create the ad. A co-worker of mine made me aware of this group and the ad that ran today. Well, I don't want to divulge anything that I'm not completely sure about, but don't be surprised to see something controversial posted within the next few days about Rodriguez on the pages of one local Detroit newspaper. Again, I don't have anything definitive, but I have a feeling the placement of this ad in today's Detroit News is being provoked by something about to come. this was not my idea but I did support it with a dontaion. actually this ad has been in the works since before the ND game when all the freep stuff came out. this was the soonest it could get it into the News as I remmeber it and had nothing to do with the 4 straight wins to open the season or anything to do with an article coming out this week in the freep. MSU week seemed a perfect time to run it. I really wish people would stop referring to Michigan fans and sports fans in general as "nations".